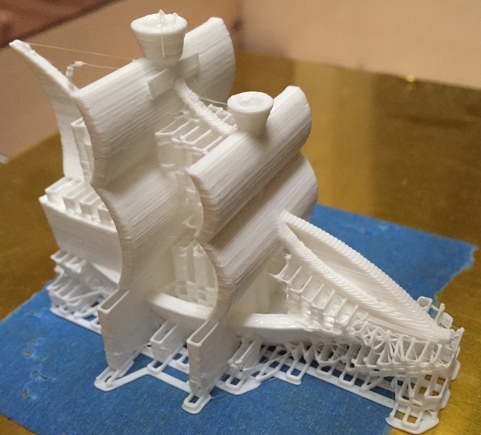 For several years, on and off, I have dabbled in 3D printing. 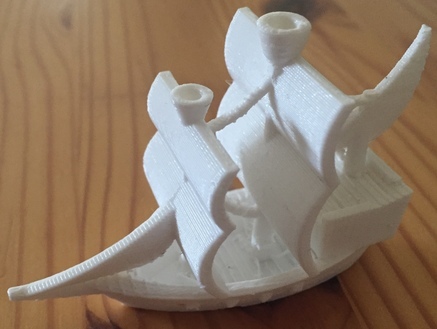 To download and order printed items is something trivial these days, however my interest is in the [relatively simple] 3D modeling formats in use. I started out using SketchUp but eventually found it to be restrictive. The only artifact remaining from those days is this compiled X3G file, ready to print on a FlashForge printer (note: I have the older FlashForge with a frame made out of wood; your results on newer models currently available may vary). My next step was to generate STL files directly. Building a surface is relatively simple, and you can use the following C code to try that out. 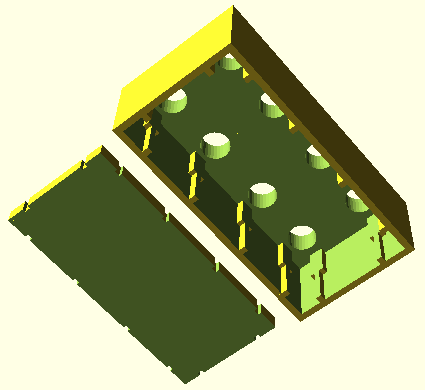 Lately I like describing shapes in the OpenSCAD language which has support for set operations (intersect, subtract, union, etc.) as well as loops etc. 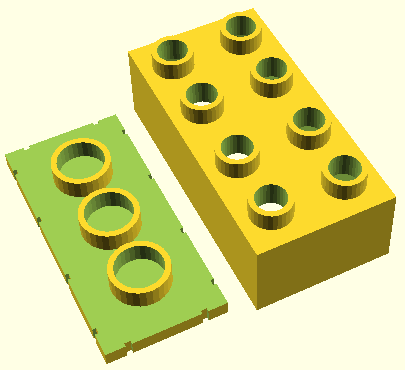 Here is the code to generate a brick compatible with the Lego Duplo line. The brick is hollow to allow for some further experimentation that a will not go into right now. Our work on sensor fingerprinting got picked up by SF Chronicle (and also in print, on Friday, October 11th, 2013), ArsTechnica, Discovery News, and other news outlets. In other news: customizing the Android OS. Don't miss the explainer video about FleetOS! Working hard on research involving the use of implicit learning of motor tasks for authentication purposes. The work was extensively featured in the media in the summer of 2012. USENIX Security 2012 paper on designing security primitives resistant to user coercion (a.k.a. "rubber hose cryptanalysis"). I have been increasingly interested in user behaviors at the intersection of security, wireless computing, and the web. In particular, Android has been an excellent, open platform for experimentation. A Python script for batch AVI to MP4 conversion on Windows, along with the required the preset file. Web servers are getting embedded in electronic appliances of all kinds: from home routers, to picture frames and IP phones. Usually the goal is to provide a familiar management interface for the devices; security is typically an afterthought. In recent work we have evaluated the security of web interfaces exposed by a broad range of consumer and enterprise hardware. Тази година Международната Олимпиада по Информатика беше проведена в Пловдив, България. По този случай БНТ засне филм с интервюта на бивши и настоящи участници и ръководители от Българските отбори. Постарах се да напиша накратко впечатленията си от Американската образователна система и от организацията на компютърната индустрия в САЩ (с фокус върху Силициевата Долина). В процеса на редактирането получих много ценни коментари от приятели, които също като мен са бивши олимпийци. Новогодишен подарък за изгряващите звезди на информатиката в България. Network Appliance completed the acquisition of Decru in August. Proud to have been one of the original engineers for the DataFort E-series. ICMAS 2000 paper: "Multi-agent Control of Emergent Behaviors"
ICRA 2000 paper: "Emergent Structures in Modular Self-reconfigurable Robots"